The SDOCK2U33RE Dual 2.5/3.5" SATA HDD/SSD duplicator dock lets you duplicate/clone an existing hard drive without the use of a host computer system -- or dock and swap drives from your desktop or laptop computer simultaneously, using a single USB or eSATA port. The SDOCK2U33RE offers convenient dual-function performance. As a hard drive duplicator, the SDOCK2U33RE lets you create an exact sector-by-sector clone from one hard drive to another, including partitions and boot sector information -- ensuring data integrity and consistency for sensitive operations, such as data recovery. As an external hard drive dock the SDOCK2U33RE lets you connect your drives through either eSATA or USB, with each drive slot individually supporting high capacity 2.5/3.5" hard drives or solid state drives, tested up to 4 TB. With support for SATA III (6 Gbps) you can maximize efficiency with duplication speeds up to 22 GB per minute, and eSATA docking speeds up to 6 Gbps. 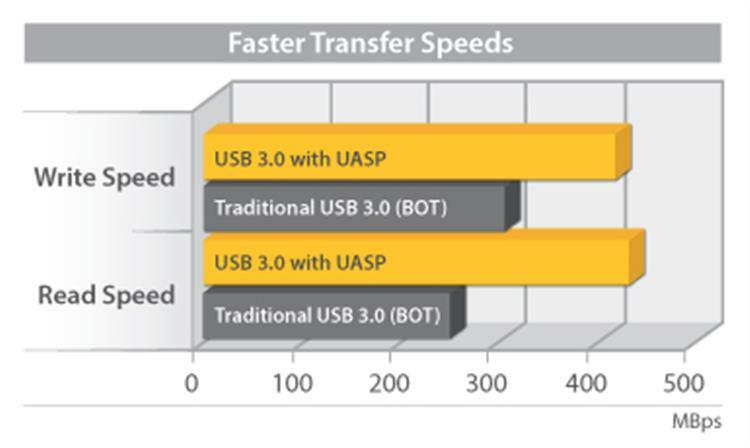 The Dock can also be connected through USB 3.0 with UASP for transfer speeds up 5 Gbps (70% faster than conventional USB 3.0). See our UASP testing results below for further details. With push button operation and plug-and play installation, the duplicator dock has been specially designed for hassle-free operation. The SDOCK2U33RE lets you quickly dock your hard drives or start duplicating hard drives with the push of a button. Plus, the built-in LED progress bar saves you time by letting you easily monitor the entire duplication process, so you'll know exactly when it's time to start your next operation. SDOCK2U33RE is backed by a StarTech.com 2-year warranty and free lifetime technical support. Our company has purchased about a dozen and neither will clone our drives to where they will boot and if they do it BSOD after a bit or system errors start popping up and also Outlook breaks in some cases. We turned around and used an older and a newer Kanuru to clone those same drives and they work flawlessly other than re-activate Office and that was in both cases. Mgmt is working with support to return devices. We're sorry that SDOCK2U33RE hasn't worked well for you. This duplicator is not capable of copying a Host Protected Area (HPA), so if your drives feature this, SDOCK2U33RE may not be able to produce a bootable clone. In this case, we recommend using a duplicator such as our UNIDUPDOCK which is capable of duplicating a drive's HPA. We'd be happy to talk further about this and help get a working solution in your hands. To reach us, go to www.startech.com/support. We're available 24 hours a day, 5 days a week, to provide support. I was excited to get a new one. Had the older model for years but this one arrived dead. Could be the power adapter or the mb. Idk. Going to see what hoops I have to go thru with their support. If they send out a new one without me having to send this back first, then I’ll change my review. I bought this in July and it worked fine until today. It no longer works. The Blue and Red lights come on but when I press the "Start" button nothing happens. Tried it several times with same result. It is not working! Thank you for reviewing our SDOCK2U33RE, we are sorry to hear it is not working well for you. First, please ensure the USB cable is not connected and the docking station is set to duplication mode by pressing the PC/Copy Mode button for 3 seconds until the mode LED is set to red. It may take up to 10 seconds for each drive to be ready. Please wait for both the drive LEDs to become blue before attempting a copy. Additionally, please ensure the source drive is a smaller capacity than the destination or the copy will not be able to start. We would like to assist in troubleshooting the issue with you. We can even replace it under its 2-year warranty if needed. Please contact our support available 24 hours a day 5 days a week at 1 800 265 1844 or www.startech.com/chat. A member of our team will also be reaching out directly to provide support. (5 stars) Duplicates hard drives in no time! At work we have had some people using laptops that were using 5400 and 7200RPM hard drives and with how economical solid state drives are these days the upgrade for the productivity gains of endusers just makes sense! Depending on how much data is on a hard drive I have cloned drives in as little of 12 minutes and some have taken 25 minutes. The SDOCK2U33RE eSATA / USB 3.0 Hard Drive Duplicator Dock is easy to use and a must for all IT departments! I received this product in exchange for an unbiased review. 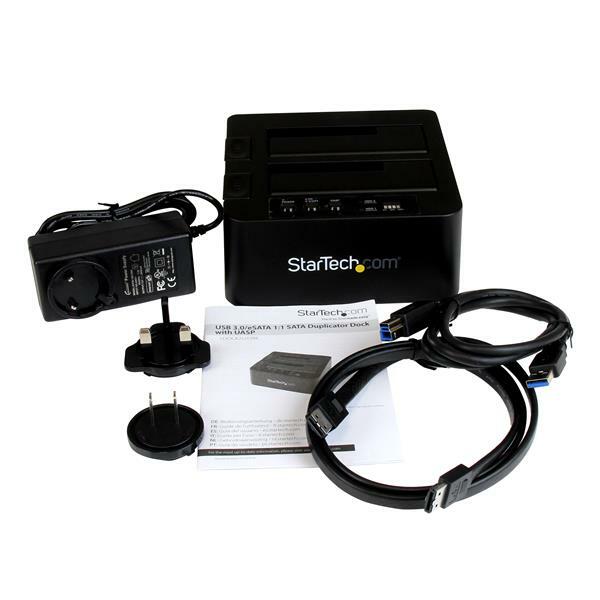 I got this From Startech to test and I'm impressed with the product based on the price. It took a while to get it working but after I followed all the instructions,I got it going and the only thing I didn't like was the time it takes to clone 1TB hard drive if I compare to Startech UNIDUPDOCK which is a little bit more money and faster. If you are looking for a duplicator and doesn't need a fast job then this is the product you want. Disclaimer "I received this product in exchange for an unbiased review"
I have been using this product for a few weeks now to duplicate drives and connect drives to my computer via USB. So far everything has been working well. I have used this device with many different sizes, types and brand of drives. The duplicator came with USB and eSATA cables for the computer as well as power adapter with ends for multiple countries. The cables are only about 1 meter, which I wish were longer, but I could purchase new ones if it becomes an issue. I have purchased the SAT2IDEADP separately so that I could also connect some old IDE drives (works flawlessly with this). I keep the quick guide handy to reminded me what each of the blinking lights means and for double checking before starting copy operations. You can connect two drives at the same time while connected to the computer using USB and both disks show up on the computer. This allows for picking and choosing which data to copy between two disks as well as multitasking between different tasks. The data transfer is very fast over USB 3.0 and keeps up with the expected disk speed. I have not tested using eSATA as I don't have this port on any of my devices. In Windows 10 with USB connected, there is no setup required. Just plug it in, turn it on and when a disk is connected it immediately pops up in Windows ready for use. Disk duplication is pretty fast (not fantastic but close), but I like that my computer isn't needed and I can leave it to run overnight or while I do other tasks. This is an essential tool for any person task with supporting desktop or laptop computers. I use this device for disk backups, file recovery, drive migrations, disk upgrades, off-line disk access, wiping disks and many other troubleshooting tasks. One wish (not a deal breaker): After I duplicate a drive I have to wipe the original. This requires a connected computer with appropriate software and hours continuous operation. If this option were available it would be beyond excellent. The device is very solid and doesn't move around the desk when the disks are being used. The case is made of plastic but the internals and eject mechanisms are sturdy metal. I expect this product will last a long time and looks very professional when on my desk. So far I am very happy with this product and will continue to use it often. I received this product in exchange for an unbiased review. This product includes the docking station, USB 3.0 cable, eSATA cable, and power adapters The encasement is bulking looking and not a modern looking design. The unit has 2 drive bays which can be used to clone a 2.5 in. or 3.5 in. hard drive without a host computer. Note that it duplicates the entire drive and you cannot be selective by partitions. The two bays are labeled HDD1 and HDD2. I think it would have been be safer to label the bays source and destination so there is no confusion when cloning drives. There is an indicator on the unit which shows the percentage completed when cloning drives. Approximate time to clone a 500GB HD was just a little over 1 hour. When using the unit as a docking station, I could only get it to recognize one drive at a time even though following the instructions precisely. As advertised, this unit easily clones drives and can be used as a docking station for an external hard drive. I received this product in exchange for an unbiased review. If you are looking for a solution that is very simple and easy to implement then this SATA Duplicator Dock is what you need. I had a laptop 2.5in hard drive that had some back sectors on it so I needed a way to duplicate the data to a new drive. I had never used this device before but it was as simple as taking it out of the box, plugging in the power cord, inserting the 2 drives and then pushing Power, Copy, Start. With a 22GB per minute copy throughput this did not take long to complete. Once finished I installed the new hard drive into the laptop and it booted up into the operating system and has worked since. I also tested out the USB docking feature by plugging it into my MacBook Pro and all of the partitions on the old hard drive were available including the laptop recovery image partition. And once again it was as simple as pushing the Power button because this unit defaults to the PC docking mode. (1 star) does not work. copied seveal small boot SSD drives to larger ones. Data copied , but were not bootable. The M.2 Adapter would not read any of my M.2 sticks. I will be boxing it all up to return it. I have been in the technology business for over 35 years and for the past 20+ years I have been asked to provide unbiased reviews of various products from both the AV and IT world. In review of this product I have found that it works with both 2.5" and 3.5" SATA Drives as well as HDD and SSD. The unit works with Windows 2000/XP/Server 2003/Vista/Server 2008 R2/7/8/8.1 both 32/64 bit as well as Apple Mac OS 9.x/10 Chrome OS and Linux. The ease of use was well thought through, simply plug in the drives, a couple of clicks and the unit does the rest. The overall speed is just a bit slower than expected but in the balancing act of speed, ease of use and cost, I give this product an excellent review in walking that line. In the box: -SATA HDD Duplicator Dock -USB 3.0 Cable -eSATA Cable -Universal Power Adapter (NA/UK/EU) -Instruction Manual I received this product in exchange for an unbiased review. 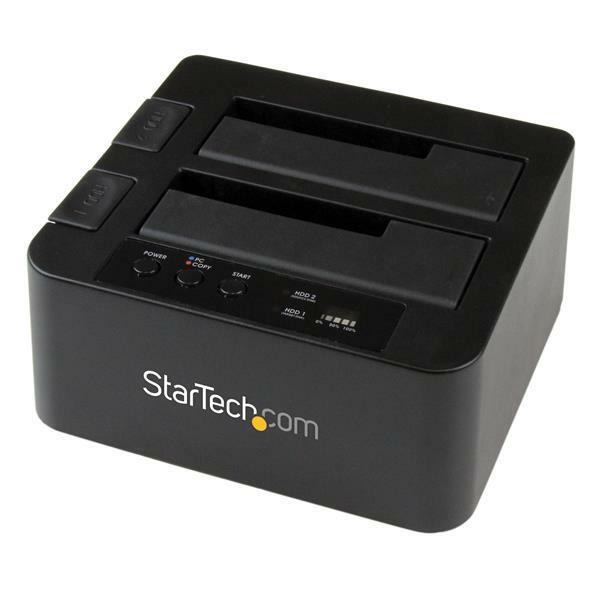 When typing in the part number to review the dock I also saw the other options Startech makes like the 4 bay Hard Drive docking station. The information panel on the Drive is easy to use and well thought out. Showing source and target and what percent is done. On the outside of the white box packaging, I saw a label VI so my guess is this is the 6th generation of the Duplicator and improvements have been made each time the Duplicator was redesigned and engineered. The rubber feet on the bottom are a nice addition so it will not slide even on a slightly inclined surface. (5 stars) Does what they say! I bought this little box some time ago now when I needed to replace a HDD which had become too cluttered with all my photos. I bought at the same time a Seagate Hybrid Hdd/SSD of 1TB. Stuck both drives in the unit as instructed, switched on and in no time at all I had cloned the 1TB Hybrid with all my data, put it into my laptop and was back on with my toes hardly touching the ground!!! Its nice if you works with HDDs and SSDs. Just plug in and done. You can see all the data of multiple HDDs and copy them between them. I'm satisfied. But about duplication, it is a little slower that i was thinking. Did clone HDD to another one of 500 GBs and its took about 2 with half hours... If i was using some desktop with 2 disks, both connected over SATA III, it was going be done in 30 minutes. So, its good for duplication when you what to make 2 clicks and start duplicate and going to deal with another things, but not for extreme fast cloning. (If you planning to deploy large environments, or class room). Hello Meagant, Thank you for taking the time to review our SDOCK2U33RE docking station as we value feedback and are always looking for ways to improve the products we offer. I would like to help by clarifying some of the functionality of this model of dock. 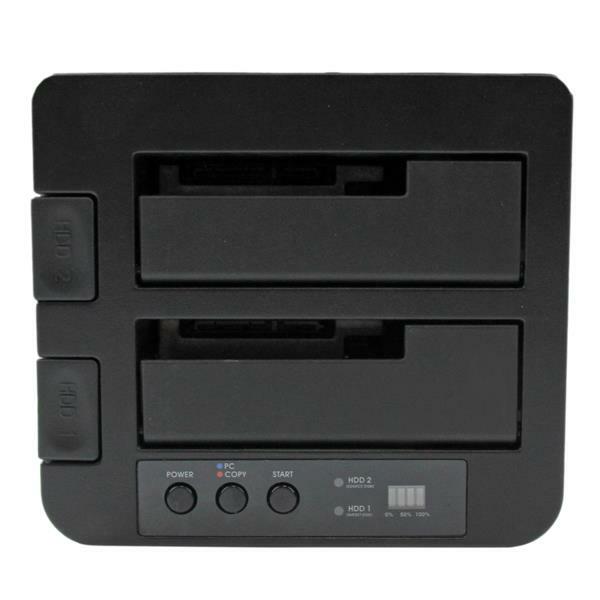 For the power button, it is only used to power the connected hard drives on or off and will control the power of both the HDD1 and HDD2 slots at the same time. Please be sure to press and hold the power button to power off the disks as a quick press will not activate the button. If the dock is connected to a computer using USB the PC/copy LED may be lit as the dock would be able to receive power from the connected computer system. Is the power button able to control the power state of the connected drives? With this model of dock the “PC/Copy” LED will always be on and will show which mode the docking station is in. With the LED being blue it shows that the dock is connected to a computer using a USB cable and is currently in the “PC” mode. While in this mode the dock will be unable to copy a drive and will require that the dock be disconnected from the computer first, and then press and hold the PC/copy button for 3 seconds until the LED turns red. If the dock is connected to a computer while powered on it will default to the PC mode as a safety measure to ensure the drive in the destination slot (HDD1) will not be accidentally erased. We are always here to help with our free lifetime technical support. If this did not resolve your issue, please get in touch with us and reference case #332-273207 so we can further assist you. Hello Meagan, Thank you for taking the time to review our SDOCK2U33RE docking station as we value feedback and are always looking for ways to improve the products we offer. I would like to help by clarifying some of the functionality of this model of dock. For the power button, it is only used to power the connected hard drives on or off and will control the power of both the HDD1 and HDD2 slots at the same time. Please be sure to press and hold the power button to power off the disks as a quick press will not activate the button. Is the power button able to control the power state of the connected drives? With this model of dock the “PC/Copy” LED will always be on and will show which mode the docking station is in. With the LED being blue it shows that the dock is currently in the “PC” mode which is the default setting. While in this mode the dock will be unable to copy or erase a drive as a safety measure to ensure the drive in the destination slot (HDD1) will not be accidentally erased by pressing the Start button. To perform a duplication please press and hold the PC/copy button for 3 seconds until the LED turns red and then press the Start button to begin the duplication. We are always here to help with our free lifetime technical support. If this did not resolve your issue, please get in touch with us and reference case #332-273207 so we can further assist you. 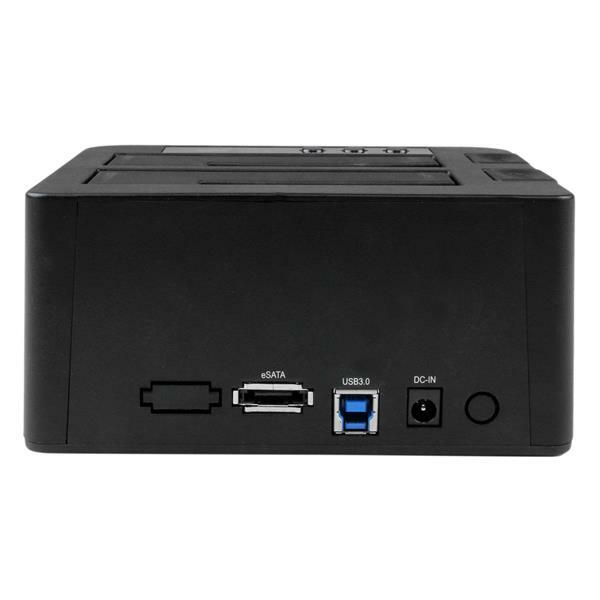 Hi what is the difference between this one and the USB 3.0 Dual 2.5 3.5" SATA HDD dock with USAP? One is to clone and the other is to transfer? Thanks!